What should I do when there is a license text in code from an answer? I came across an answer from a question in the bounty section and upvoted the answer, because it makes more sense and looks helpful than the other ones, but this answer had a complete MIT license text in it. It is looked unnecessary to me. I am getting accused of "breaking the law" and not "respecting his rights". Now, OP removed the code from the answer and linked to a GitHub page. At least, the license text is now gone. Should we ignore the license texts in posts? There's a lot of confusion here, and it's causing far more problems than are necessary. Disclaimer: I'm not a lawyer. Don't interpret this as legal advice. If you are the sole author of something, you can license it however you want. You can have one license, or two licenses, or multiple licenses - the folks using it can then choose whichever license they wish to use. If you're posting code here, then you must agree to license it under the CC-BY-SA license. This doesn't preclude you from also offering it under other licenses - if you have the authority to set one license, then you can also set however many other licenses. Lots of folks go out of their way to specify that they're dual-licensing the code they post on Stack Overflow. For instance, this guy. And that's fine. What we need to ensure here is that the author of that answer understands that putting an MIT license on their code does not strip the CC-BY-SA license; it only adds another license to the pile. Also, that posting here (with or without a license) never puts it in the public domain by default; if they're the author, then they retain full rights to it, with the caveat that by posting they're agreeing to license it to both Stack Overflow and any readers under the terms of CC-BY-SA. If they're ok with that, then they can put an MIT header in, or whatever. If they're not ok with that, then they shouldn't post the code here - hosting it on GitHub is actually preferable, as long as the answer stands on its own. Not the answer you're looking for? Browse other questions tagged discussion answers ethics license . Is it valid if one licenses their own answer at Stack Overflow? Is linked code (ex. pastebin) in questions seeking debugging help covered by SO license? 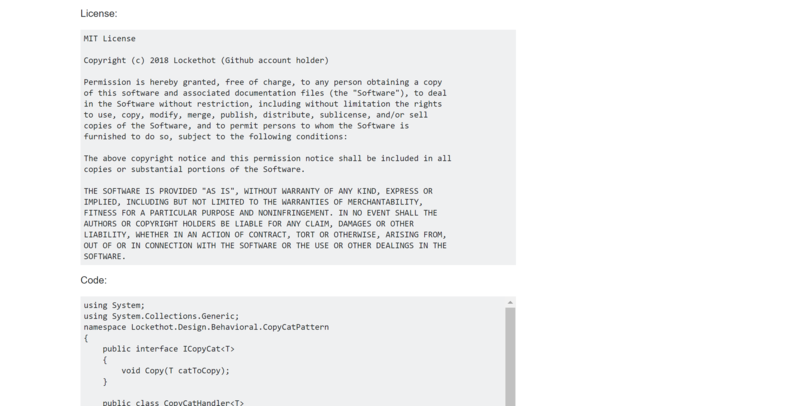 Can we get some explicit clarification on the *intended* legal usage of code from SO answers? Can SE users change the license of their content with profile text? How do I apply a license to the code in dozens of my old posts? The answer I'm writing exceeds the 30k maximum character limit; what should I do?